Plums grow in many parts of the world, including North and South America, Europe, and Asia. More than 140 types of plums are available in the United States. Varieties that originated in Europe tend to be purple-skinned, but there are other varieties that are white-, yellow-, green-, or red-skinned. Inside, the flesh of plums can be white, green, orange, purple, pink, black, or red. The more purple the plum, the more anthocyanins it is likely to contain, and the more purple parts will be richest in them�so eat the skins! But plums have lots of other nutritional value as well. They are a good source of calcium, magnesium, potassium, vitamins A and C, lutein, and beta-carotene. Plums are also a significant source of the trace mineral boron, which is helpful in converting calcium to bone and may therefore play a role in preventing osteoporosis. Plums, along with prunes, have earned their reputation as a remedy for constipation. In addition to a healthy dose of fiber, they contain sugars, including sorbitol, a sugar alcohol that draws water from the intestine to produce a laxative effect, and isatin. Some sources say that most of the sorbitol and isatin is in the plum skin and advise peeling the fruit to avoid this side effect. Although plums are quite sweet, they don�t cause blood sugar to spike, probably because of the fiber, fructose, and sorbitol that all contribute to slowing down absorption of the sugars. One medium raw plum provides 36 calories, 8.6 g carbohydrate, 0.5 g protein, 0.4 g fat, 0.9 g dietary fiber, 213 IU vitamin A, 6 mg vitamin C, 1 mcg folic acid, 114 mg potassium, 3 mg calcium, 7 mg phosphorus, and 5 mg magnesium. Prunes are rich in anthocyanins, as well as a good source of calcium, magnesium, potassium, vitamins A and C, lutein, and beta-carotene. They are a significant source of the trace mineral boron, which is useful in converting calcium to bone and may play a role in preventing osteoporosis. Prunes have many of the same health Benefits as plums (their fresh counterparts), with more concentrated sugars and fiber, due to the drying. Prunes have recently undergone an image-improvement campaign, thanks mainly to Sunsweet, a growers� cooperative that produces about two thirds of the world�s prunes. Prunes are dried plums, although there are specific varieties that are grown especially for drying, to retain more sweetness and better texture. 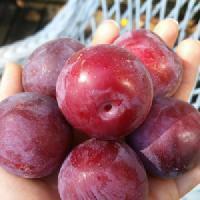 Some varieties of plum have traditionally been called �prune� even when fresh. Prunes, as well as plums, have earned their reputation as a remedy for constipation. In addition to a healthy dose of fiber, plums and prunes contain sugars, including sorbitol, a sugar alcohol that draws water from the intestine to produce a laxative effect, and isatin. Prune juice contains some of the prune skin because unlike the juices of fresh fruits, it is made by softening dried prunes and then pureeing them. Although prunes are quite sweet, they don�t cause blood sugar to spike, probably because of the fiber, fructose, and sorbitol that contribute to slowing down absorption of the sugars. Five dried prunes provide 100 calories, 26 g carbohydrate, 1.1 g protein, 0.2 g fat, 3 g dietary fiber, 834.5 IU vitamin A, 1.5 mg vitamin C, 0.8 mg niacin, 1.5 mcg folic acid, 313 mg potassium, 21.5 mg calcium, 1.5 mg sodium, 33 mg phosphorus, 1.04 mg iron, and 19 mg magnesium. The pomegranate is a fruit so unusual and delicious that it has attracted attention throughout history, having been cultivated throughout the Mediterranean since ancient times. Because Persephone ate pomegranate seeds while in the underworld, she was doomed to spend part of each year there, resulting in the origin of winter in Greek mythology. The ancient Egyptians used pomegranate for its medicinal powers, even including the fruit in their elaborate burials. It�s mentioned in the holy books of Judaism, Christianity, and Islam. 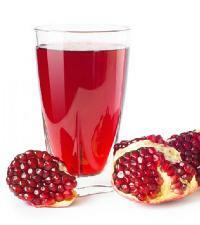 Ayurvedic medicine uses all parts of the pomegranate�fruit, leaves, bark, and flowers. Pomegranate flowers, because of their astringent properties, were used in 19th-century English medicine to treat skin irritations, sore throats, and diarrhea. Pomegranate juice is high in potassium and a good source of vitamin C, vitamin B5 (pantothenic acid), and many polyphenols and antioxidants, some of them unique to this fruit. It has demonstrated potential in the laboratory, including in preliminary human trials, for reducing several risks related to oxidation and atherosclerosis that are involved in heart disease. As an antioxidant, it has a moderate ORAC of 2,860 units per 100 grams. The seed-juice sacs of a pomegranate, called �arils,� are a significant source of linolenic acid, which has shown some potential for combating insulin resistance. Pomegranate seed oil has also been effective against breast cancer cells in the lab. One medium raw pomegranate provides 105 calories, 26.4 g carbohydrate, 1.5 g protein, 0.5 g fat, 0.9 g dietary fiber, 9 mg vitamin C, 9 mcg folic acid, 399 mg potassium, 5 mg sodium, 12 mg phosphorus, and 5 mg magnesium. Quinces originated in the Caucasus region, and Turkey remains the largest producer, although they are grown throughout the Middle East as well as in Chile, Uruguay, and Argentina. Though quinces were once grown widely in the United States, they have been subject to insects and blights, and now most of the quinces available in the United States come from Argentina. Quinces are especially high in pectin, a soluble fiber that helps lower blood cholesterol. Quinces are a good source of vitamin A and iron, and they provide moderate amounts of potassium, vitamin C, and calcium. 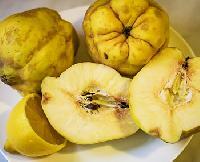 Quinces� high acid content is thought to help with the digestion of fatty meals. Research on the closely related Chinese quince shows potential for preventing stomach lesions and combating some viruses. The high pectin content of quinces accounts for their common use in jams and jellies. Quinces were traditionally used to produce an extract for treating coughs and sore throat, as well as for digestive problems. They also have a pleasing sweet smell and have long been used as the base for pomanders. One medium raw quince provides 52 calories, 14.1 g carbohydrate, 0.4 g protein, 0.1 g fat, 1.7 g dietary fiber, 37 IU vitamin A, 14 mg vitamin C, 3 mcg folic acid, 181 mg potassium, 4 mg sodium, 16 mg phosphorus, 10 mg calcium, 7 mg magnesium, and 0.12 mg iron. Raisins are dried grapes, but their extensive history puts them in a special class. Raisins are nearly 80 percent carbohydrate, most of which is sugar, but they also provide significant fiber, as well as minerals like potassium, calcium, and fluoride. In an experiment designed to test the effectiveness of relatively minor lifestyle changes, researchers found that women who ate a cup of raisins a day for six weeks lowered their blood pressure, reduced their waist size, reduced signs of inflammation, and lowered their blood cholesterol and triglycerides. It appears raisins may also help with oral health: Polyphenols extracted from raisins suppressed the growth of some germs that attack the mouth and gums, including some that set the stage for oral cancers. 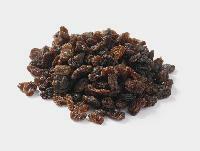 Raisins also appear to be one of the main sources of boron in the American diet. This trace mineral may have a role in calcium metabolism and preventing osteoporosis. One-quarter cup of seedless raisins, packed, provides 123 calories, 32.7 g carbohydrate, 1.3 g protein, 0.2 g fat, 1.5 g dietary fiber, 0.95 mg vitamin C, 1.5 mg vitamin K, 0.32 mg niacin, 4.6 mg choline, 20.5 mg calcium, 0.78 mg iron, 13.3 mg magnesium, 41.8 mg phosphorus, and 309 mg potassium. Raspberries are frequently studied for their health effects, because they are a significant source of anthocyanins, antioxidants, and phytochemicals. Raspberries are one of the few berries with the potential to inhibit the formation of cancer tumors, according to experiments involving human subjects. Raspberries contain ellagic acid, quercetin, and kaempferol, as well as anthocyanins. They have an ORAC of 4882, one of the highest among rated foods. Because raspberries are aggregate fruits, made up of many small beads of fruit, each containing a seed, they are very high in fiber. One cup of raw raspberries provides 60 calories, 14.2 g carbohydrate, 1.1 g protein, 0.7 g fat, 8.4 g dietary fiber, 160 IU vitamin A, 31 mg vitamin C, 32 mcg folic acid, 187 mg potassium, 15 mg phosphorus, 27 mg calcium, 22 mg magnesium, and 1.25 mg manganese. Although strawberries don�t pack the anthocyanin punch of some of the purple fruits and berries, they do contain at least two anthocyanins, and they are an excellent source of a variety of other flavonoids, including catechin, quercetin, and kaempferol, as well as vitamin C, potassium, beta-carotene, lutein, and ellagic acid. This makes strawberries potential cancer fighters. Fisetin, another flavonoid found in strawberries, has been shown to improve long-term memory in mouse studies, although researchers warn that humans would have to eat ten pounds a day to get an equivalent effect. One cup of raw strawberries provides 45 calories, 10.5 g carbohydrate, 0.9 g protein, 0.6 g fat, 3.4 g dietary fiber, 40 IU vitamin A, 84 mg vitamin C, 26 mcg folic acid, 247 mg potassium, 1 mg sodium, 28 mg phosphorus, 21 mg calcium, and 15 mg magnesium. Like other members of the citrus family, especially the oranges that they most resemble, tangerines are full of vitamin C and a great source of beta-carotene. They also provide potassium, magnesium, and many B vitamins, including B1, B2, B6, folic acid, and pantothenic acid. Tangerines have the highest concentration of pectin, a soluble fiber helpful in reducing cholesterol, among the commonly eaten citrus fruits. They also contain lutein, which may help prevent macular degeneration, and hesperidin, which helps keep blood vessels healthy and has shown potential for fighting osteoporosis. 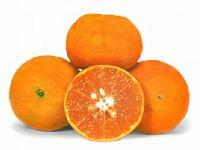 One medium raw tangerine provides 37 calories, 9.4 g carbohydrate, 0.5 g protein, 0.2 g fat, 1.9 g dietary fiber, 773 IU vitamin A, 26 mg vitamin C, 17 mcg folic acid, 132 mg potassium, 1 mg sodium, 8 mg phosphorus, 12 mg calcium, and 10 mg magnesium. Vietnamese legend says that the watermelon originated there in answer to the prayer of an exiled prince. But this fruit is so easy to love that it has been cultivated wherever it has traveled�watermelon seeds were found in Tutankhamen�s tomb, North African traders brought it to Europe by the 13th century, and it appears to have been adopted by Native Americans early in the history of their contact with Europeans. As captured in its name, watermelon is mostly water�making it a refreshing treat and a somewhat portable source of hydration. It provides vitamin A, vitamin C, potassium, and some B vitamins. Watermelon is also a rich source of lycopene, which is a phytochemical found in some red fruits and vegetables. (Lycopene is often regarded as the likely agent in the tomato�s apparent prevention of some cancers.) Watermelon rinds are a significant source of citrulline, which helps lower blood pressure by relaxing blood vessels. One cup of raw watermelon pieces provides 51 calories, 11.5 g carbohydrate, 1 g protein, 0.7 g fat, 0.8 g dietary fiber, 586 IU vitamin A, 15 mg vitamin C, 4 mcg folic acid, 186 mg potassium, 3 mg sodium, 14 mg phosphorus, 13 mg calcium, and 18 mg magnesium. Acorn squash is one of the winter squashes, which in temperate climates are harvested in the autumn when their seeds have matured and their outer skins have hardened into a rind. They�re called �winter� squashes because, before refrigeration, they could be kept and eaten through the winter. As you might guess from the acorn squash�s orange flesh, it is a good source of antioxidant carotenes. It also provides the minerals magnesium, manganese, potassium, and calcium, and vitamins A and C.
One-half cup of baked acorn squash cubes provides 57 calories, 14.9 g carbohydrate, 1.1 g protein, 0.1 g fat, 4.5 g dietary fiber, 437 IU vitamin A, 11 mg vitamin C, 19 mcg folic acid, 446 mg potassium, 4 mg sodium, 46 mg phosphorus, 45 mg calcium, and 44 mg magnesium.